Microsoft released the first version of Windows 10 three years ago and privacy has been a hot topic ever since. 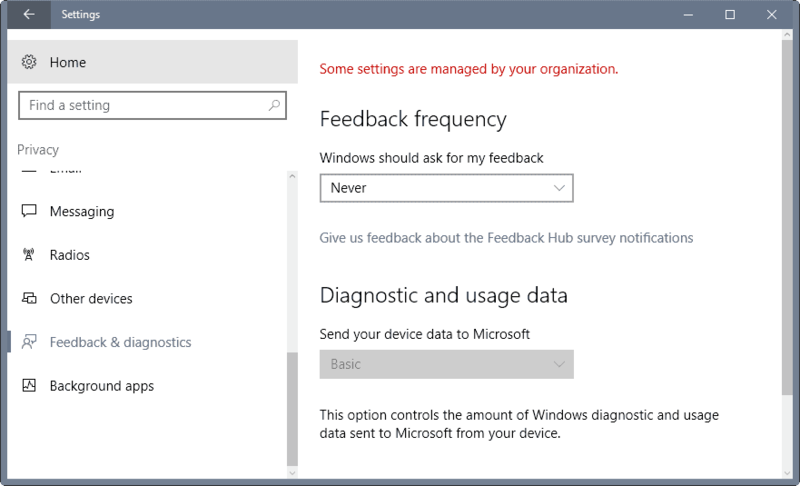 We published Windows 10 and Privacy back in 2015 to highlight privacy issues such as the inability to turn off Telemetry collection and transfers in the user interface. Microsoft was criticized by government agencies in various countries such as France or the Netherlands for privacy issues, and a rising arsenal of privacy tools for Windows 10 promised users protection against the data hunger of Microsoft. One option that Windows users and administrators have is to block endpoints so that connections can't be established. The method requires extensive testing as critical functionality may become unavailable when connections are blocked. If you block Windows Update endpoints, you should not be surprised that you cannot use the automatic updating system anymore to keep the operating system up to date. Default Windows 10 systems, those installed using default settings and left untouched, make a large number of connections automatically for a variety of purposes. Windows 10 checks for updates regularly, checks new files against Windows Defender databases, or submits telemetry data to Microsoft. While some connections are required for the operating system to work properly, others may be disabled without noticeable impact in functionality; the latter is true especially if features are not used on the system. Microsoft released a master list of Windows Endpoints for non-Enterprise and for Enterprise editions of Windows recently. The non-Enterprise listing is available for Windows 10 version 1709 and 1803, the Enterprise-specific listing for Windows 10 version 1709. Tip: Check out my side-project Privacy Amp for detailed lists and other privacy related topics. Without further ado, here are the connection endpoints of Windows 10 version 1803 (non-Enterprise). *.e-msedge.net HTTPS Used by OfficeHub to get the metadata of Office apps. *.g.akamaiedge.net HTTPS Used to check for updates to maps that have been downloaded for offline use. *.s-msedge.net HTTPS Used by OfficeHub to get the metadata of Office apps. *.tlu.dl.delivery.mp.microsoft.com/filestreamingservice/files/ HTTP Enables connections to Windows Update. arc.msn.com.nsatc.net HTTPS Used to retrieve Windows Spotlight metadata. arc.msn.com/v3/Delivery/Placement HTTPS Used to retrieve Windows Spotlight metadata. client-office365-tas.msedge.net* HTTPS Used to connect to the Office 365 portal’s shared infrastructure, including Office Online. config.edge.skype.com/config/* HTTPS Used to retrieve Skype configuration values. ctldl.windowsupdate.com/msdownload/update* HTTP Used to download certificates that are publicly known to be fraudulent. cy2.displaycatalog.md.mp.microsoft.com.akadns.net HTTPS Used to communicate with Microsoft Store. cy2.licensing.md.mp.microsoft.com.akadns.net HTTPS Used to communicate with Microsoft Store. cy2.settings.data.microsoft.com.akadns.net HTTPS Used to communicate with Microsoft Store. displaycatalog.mp.microsoft.com* HTTPS Used to communicate with Microsoft Store. dm3p.wns.notify.windows.com.akadns.net HTTPS Used for the Windows Push Notification Services (WNS). fe2.update.microsoft.com* HTTPS Enables connections to Windows Update, Microsoft Update, and the online services of Microsoft Store. fe3.delivery.dsp.mp.microsoft.com.nsatc.net HTTPS Enables connections to Windows Update, Microsoft Update, and the online services of Microsoft Store. g.live.com/odclientsettings/Prod HTTPS Used by OneDrive for Business to download and verify app updates. g.msn.com.nsatc.net HTTPS Used to retrieve Windows Spotlight metadata. geo-prod.dodsp.mp.microsoft.com.nsatc.net HTTPS Enables connections to Windows Update. ipv4.login.msa.akadns6.net HTTPS Used for Microsoft accounts to sign in. licensing.mp.microsoft.com/v7.0/licenses/content HTTPS Used for online activation and some app licensing. location-inference-westus.cloudapp.net HTTPS Used for location data. maps.windows.com/windows-app-web-link HTTPS Link to Maps application. modern.watson.data.microsoft.com.akadns.net HTTPS Used by Windows Error Reporting. ocos-office365-s2s.msedge.net* HTTPS Used to connect to the Office 365 portal's shared infrastructure. ocsp.digicert.com* HTTP CRL and OCSP checks to the issuing certificate authorities. oneclient.sfx.ms* HTTPS Used by OneDrive for Business to download and verify app updates. query.prod.cms.rt.microsoft.com* HTTPS Used to retrieve Windows Spotlight metadata. ris.api.iris.microsoft.com* HTTPS Used to retrieve Windows Spotlight metadata. settings.data.microsoft.com/settings/v2.0/* HTTPS Used for Windows apps to dynamically update their configuration. settings-win.data.microsoft.com/settings/* HTTPS Used as a way for apps to dynamically update their configuration. sls.update.microsoft.com* HTTPS Enables connections to Windows Update. storecatalogrevocation.storequality.microsoft.com* HTTPS Used to revoke licenses for malicious apps on the Microsoft Store. storeedgefd.dsx.mp.microsoft.com* HTTPS Used to communicate with Microsoft Store. tile-service.weather.microsoft.com* HTTP Used to download updates to the Weather app Live Tile. ip5.afdorigin-prod-am02.afdogw.com HTTPS Used to serve office 365 experimentation traffic. watson.telemetry.microsoft.com/Telemetry.Request HTTPS Used by Windows Error Reporting. .tlu.dl.delivery.mp.microsoft.com/ HTTP Enables connections to Windows Update. *geo-prod.dodsp.mp.microsoft.com.nsatc.net HTTPS Enables connections to Windows Update. au.download.windowsupdate.com/* HTTP Enables connections to Windows Update. ctldl.windowsupdate.com/msdownload/update/* HTTP Used to download certificates that are publicly known to be fraudulent. ris.api.iris.microsoft.com.akadns.net HTTPS Used to retrieve Windows Spotlight metadata. tile-service.weather.microsoft.com/* HTTP Used to download updates to the Weather app Live Tile. *.b.akamaiedge.net HTTPS Used to check for updates to maps that have been downloaded for offline use. *.telecommand.telemetry.microsoft.com.akadns.net HTTPS Used by Windows Error Reporting. .tlu.dl.delivery.mp.microsoft.com HTTP Enables connections to Windows Update. .windowsupdate.com HTTP Enables connections to Windows Update. *geo-prod.do.dsp.mp.microsoft.com HTTPS Enables connections to Windows Update. au.download.windowsupdate.com* HTTP Enables connections to Windows Update. cdn.onenote.net/livetile/* HTTPS Used for OneNote Live Tile. client-office365-tas.msedge.net/* HTTPS Used to connect to the Office 365 portal’s shared infrastructure, including Office Online. config.edge.skype.com/* HTTPS Used to retrieve Skype configuration values. ctldl.windowsupdate.com/* HTTP Used to download certificates that are publicly known to be fraudulent. displaycatalog.mp.microsoft.com/* HTTPS Used to communicate with Microsoft Store. download.windowsupdate.com/* HTTPS Enables connections to Windows Update. emdl.ws.microsoft.com/* HTTP Used to download apps from the Microsoft Store. fe2.update.microsoft.com/* HTTPS Enables connections to Windows Update, Microsoft Update, and the online services of Microsoft Store. fe3.delivery.mp.microsoft.com/* HTTPS Enables connections to Windows Update, Microsoft Update, and the online services of Microsoft Store. g.live.com/odclientsettings/* HTTPS Used by OneDrive for Business to download and verify app updates. licensing.mp.microsoft.com/* HTTPS Used for online activation and some app licensing. ocos-office365-s2s.msedge.net/* HTTPS Used to connect to the Office 365 portal's shared infrastructure. oneclient.sfx.ms/* HTTPS Used by OneDrive for Business to download and verify app updates. sls.update.microsoft.com/* HTTPS Enables connections to Windows Update. storecatalogrevocation.storequality.microsoft.com/* HTTPS Used to revoke licenses for malicious apps on the Microsoft Store. vip5.afdorigin-prod-ch02.afdogw.com HTTPS Used to serve office 365 experimentation traffic. bing.com/* HTTPS Used for updates for Cortana, apps, and Live Tiles. Microsoft published master lists of endpoint connections that recent versions of the company's Windows 10 operating system make recently. thx, informative contribution. especially for simplewall users (which i am not). as far as windows is concerned, i recommend o & o shutup : https://www.oo-software.com/en/shutup10 . M$ is making all these connections because they’re trying to eventually force end users to have to be online all the time in order to use Windows. They will then rent the OS instead of allowing a one-time payment for its use. Being online will also keep the feds happy because… well…. you know, 1984. M$ always talks about their “stategy” as if the end user is their opponent. That’s because they’ve completely lost respect for their customers. It’s time for somebody else to step up to the plate and create an alternative to the (IMO) M$ monopoly. The way I see it, once a fully functional and bug-free NON-LINUX or other UNIX knockoff OS is created, then programmers can be recruited to meet end user program needs. However, with all the copyrights and patents the government has allowed M$ to acquire, this won’t happen until some other alternative is found. M$ is just plain evil. The U.S vs. M$ case was a P.R. hoax. m$ strategy is pretty clear at this point; convince users to stream its OS, Games and Data with the convenience of pushing that data to any device for a monthly fee, that will go up every year or two.. forever. Then they will create obstacles between you and your data for even more control. Add on the windows store that will gouge a cut of profits from Dev’s and you’ve got a pretty solid ever expanding revenue stream. End goals of companies today are easy to spot when you consider that their only care is higher stock value, and they will do anything the law will allow to accomplish that task. When the law blocks their path they hire lobbyists, politicians and lawyers to clear the way. MS is now worth $800 billion. MS can afford to have contempt for users like us. I never used Home/Pro of 10, only Enterprise, LTSB and Server. Looking at those lists (and I assume “Family” SKU is actually Home), I have a hard time believing Pro does so many less traffic compared to Home. Knowing how notorious Enterprise CBB is, it’s just not possible. Even LTSB initiates a connection whnever I open a new explorer window through explorer.exe. Btw, don’t trust the “hosts” file in W10. I you use this OS and you want to block either of those domains, do it in your router. If it’s a portable machine, such as a laptop, well, then just don’t connect to other *LANs. ANd my advice, just avoid those “privacy applications” for W10. They can’t do more than what the OS allows them to. Do yourself a favour, open gpedit.msc and disable, as much as you’re allowed to do, of course, through a non-destructive way. @Yuliya, could you please elaborate on what to disable in the Group Policy Editor? Thanks! Allow Telemetry = Enabled [Secure] is the most “disabled” state of that policy. Allow Telemetry = Disabled on the other hand does not do anything. It’s the same as Windows 10’s default. Also I think you won’t be able to set it to “Secure” unless you run Enterprise. Did you not check out Martin’s link in the article? I just wanted to reinforce this. Windows 10 ignores the hosts file when doing some of its “phone home” connections. There are over 457 microsoft servers in Simplewall open source firewall blocklist. That’s the crazy amount of data mining servers. What is the procedure used to ‘block’ the end points listed above? If I remember correctly, you do need a separate device for dropping the connections. So, there’s no way to block them from inside Windows, as these connections ignore the hosts-file. In a corporate network, you’re most likely routing internet traffic through a proxy, where you could easily block these, or do it in the dedicated firewall hardware that you probably have before that still. I know I’m giving away my privacy, but since Windows 10 ( brand new installation will all the latest drivers installed ) is blazing fast and free… such is life. In July 2014, M$ abolished her Windows Testing Division comprising of about 150 professional testers and 1200 test-computers = M$ saved a bundle of ca$h. As replacement, every Win 10 Home & Pro users are forced to become M$’s unpaid Beta-testers for her forced auto-updates/upgrades. Windows Insiders and a few M$ staff became unpaid Alpha-testers. ……. Hence, the quality of Windows Update has dropped and become amateurish or unprofessional. Their Win 10 computers have also become M$’s money-making ad-box, eg preinstalled Candy Crush. P S – M$ also tried to recruit Win 7/8.1 users as unpaid Beta-testers by sneaking Telemetry updates to their computers from Oct 2015 onwards. Unfortunately for M$, Win 7/8.1 users can manually block updates. The M$$$$$oft Eco-system has grown so massive…like very hot melted lead seeping into the works. You can’t shut down or toggle a setting for more privacy, without adversely affecting your normal operating experience. I am experimenting with Linux mint as a dual boot, in an effort to one day…go all in for Linux. Microsoft has been doing a lot of glad-handing (with an evil smile) with Linux. The PLAN: If Microsoft plans to completely take over the world, they need Linux. It is sad that the United States hasn’t established better controls over Microsoft like the EU has….at least attempted. will make a new comment. I just wanted to say, “thanks Martin,” This article was very informative. First : The are clean install connections, no 3rd party software. This isn’t Martin’s list, it was published by Dani Halfin at Microsoft per the link in the article. A lot of those are Microsoft domains which do feature in the list, however things like facebook, twitter and candy crush do not phone home to Microsoft. Some really good efforts here to combat Windows’ (serious) privacy issues. I’ve been on Linux for several years now and looking over the work required to maintain (the semblance) of privacy seems never-ending and exhausting. I honestly don’t think it’s possible to protect yourself from all the spyware built into Windows (and other similar OSes). The only answer is forcing these companies to be 100% transparent about every aspect of data collection and sharing. This will slowly help force the changes required (ala Facebook). Once the OS’s of the world are totally transparent, then all you’ll need to worry about is data breaches, ransomware, and banks and insurance companies sharing your personal data. Transparency is very important. However, I don’t think that transparency, all by itself, will change any of this behavior. I think that what’s happened with Facebook is more supportive of my conjecture than of yours. The changes that Facebook has been engaging aren’t even beginning to address the underlying privacy problems with Facebook. I think that’s 100% intentional — Facebook is hoping that if they make enough noise about “fixing” some of the tangential privacy issues, that will make people forget about the real privacy issues. Remember Microsoft bought github. Such tools will be obsolete. Let M$ spend even more beellions of dollars on the *next* hosting sevice that harbours code it doesn’t like! Is M$ secretly passing on such data to the NSA when requested.? Since 2007 Microsoft’s own servers were fully open for NSA, as many other American companies servers. The last couple of years i have heard about that everything that were going on in f.ex Live and Skype were re-routed via NSA. Today when the spying is expanded (by the Trump administration) so be prepared to that they even can walk right in to Your computer and do whatever they want to via backdoors. Backdoors were found already in Windows 95. MS operates withing 14 Eyes countries. Of course they do. To much websites. My scroll buton almost broke. Martin, do you have all websites in one document for easy copying? I think what’s most hilarious is how Microsoft created these findings, their methodology clearly explained in its introduction. Because that’s what these lists are based on: findings. Not gathered from source, but by logging network traffic. 1. Set up the latest version of Windows 10 on a test virtual machine using the default settings. 2. Use globally accepted network protocol analyzer/capturing tools and log all background egress traffic. 3. Compile reports on traffic going to public IP addresses. 4. The test virtual machine was logged in using a local account and was not joined to a domain or Azure Active Directory.